Osteoporosis is a "silent" disease – there are no noticeable symptoms in most people with lowered bone density, especially in the first years. There is no pain, no swelling, no change in how the patient looks or feels. The first sign might be a bone fracture or a visible loss in height, by which time the osteoporosis is well along. That’s one reason older people should have periodic bone density tests. In medicine there is a distinction between signs and symptoms. Signs are something an external observer can see or learn without communication from the patient. Symptoms are something the patient feels. Until there is a fracture, osteoporosis produces no symptoms that the patient notices. Signs detected by medical imaging technology are the main way osteoporosis is detected these days. Other indications that a patient might has osteoporosis include back pain, back trouble, and stooped posture. Diagnosis is almost always made after a DXA scan. Osteoporosis is also a slow-developing disease. It takes years for bone density to drop to a level such that the T-score is below -2.5. The length of time varies from person to person, but almost everyone experiences thinning of bone as he or she gets older. Most people who develop the disease are past age 60 when they are diagnosed. In the advanced stages, symptoms can include pain and literal disfigurement. It is not an easy pain to treat. Don’t think aspirin or ibuprofen can relieve this type of pain. The disfigurement can make the person’s body look different. Kyphosis, aka dowager’s hump, is when the osteoporosis patient’s spine curves and compresses so much there is a loss in height. It is not always painful (sometimes not painful at all), but it tells observers the person has osteoporosis. Minor fractures might not be painful either, and the sufferer might not know a fracture has occurred without an x-ray. The minor fractures add up after a while and may cause pain, and can also increase the risk of major fractures. Stress fractures in osteoporosis patients are often caused by what might seem like trivial sources of stress. Walking or stepping down one step can trigger a stress fracture in someone with weak bones. The most common fractures occur in the wrist, hip, and spine. When fractures occur in the spine, the pain is often severe and feels to the patient like radiating pain from the middle of the body to the sides. Loose teeth can be a sign of osteoporosis, too. You hear a lot about older people having broken hips. Often it isn’t the hip per se that breaks but the femur high up near the hip. Most people who break hips have weakened bones. Sometimes they get a broken hip as a result of a fall; other times the bone breaks because of some very trivial stress (e.g. stepping down from a small step) and the resulting break causes the person to fall down. 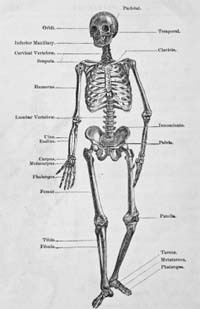 Our bones are constantly remodeled throughout life. The hard mineral matter is broken down by cells called osteoclasts and then built back up by other cells called osteoblasts. This remodeling process is important for healing microscopic fractures that occur during daily activities. Unfortunately the activity of osteoblasts slows down as we age while osteoclasts keep eating away at bone at a fairly steady rate. Over time, this results in low bone density. More on the pathogenesis of osteoporosis. As bone loss increases with age, the steady process of remodeling, or bone turnover, removes bone more than it replaces. Remodeling involves two distinct stages: (1) bone resorption or bone formation, and (2) bone formation. As men and women approach age 35, bone breakdown exceeds bone build up and bone density starts to decline. Hip fractures represent a large percentage of skeletal fractures and tend to be the most debilitating. In fact, they account for an astounding 300,000 hospitalizations each year, and one in five people with a hip fracture ends up in a nursing home within a year. A study of trends found that hip fractures among Americans increased from the mid-80s to the mid-90s and then declined to the mid 2000s. The mortality rate from hip fractures also decreased during the same period.